“I dunno,” I replied. “I just do. It’s like the information is just there in my head. For example, I know that Mozambique–” I pointed to the map, “is right there.” When I woke up, I was completely flummoxed. Partly because I was having a dream about 8th grade as an 18-year-old, but mostly because I am pretty bad at geography. Don’t get me wrong. I have a general sense of where things go. I’m aware that Africa is several nations, not one, and I can name all thirteen of Canada’s provinces and territories. I guess that makes me more geographically astute than the average American. (I’ve been informed by several International friends that American’s are notoriously bad at geography.) Unfortunately, when it comes to details, I am rubbish. Case in point? 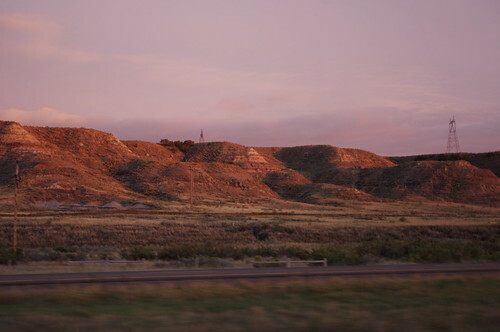 I was super excited to go through North Dakota, because I wanted to see Devil’s Tower again. 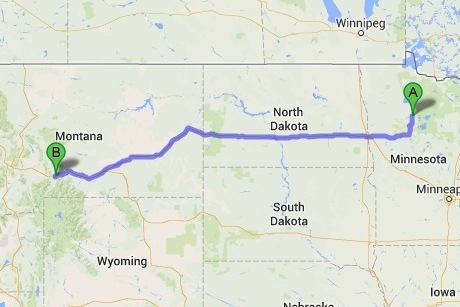 Um… YEAH… that’s in South Dakota*. Along with the Corn Palace and Wall Drug. I’m pretty embarrassed. It’s definitely time to do some remedial studying. On the other hand, it’s probably just as well that none of those places were on the way today. I told my relatives in Seattle that I’d be there by the weekend, and after spending a lot of time in Michigan yesterday, it was important to just settle down and drive. I had a lot of miles to go, and any detour would have made for a dangerously long day. This could pretty much be anywhere in the Northern region of Michigan. Although my dream tourist traps were out of the way, I did make one non-fuel stop today, to get wild rice. A had asked me to get some, and I kept passing by shops that had signs advertising it. 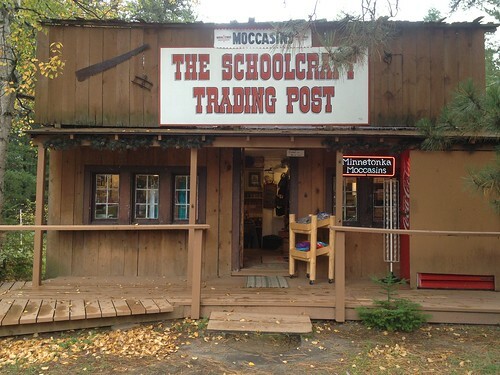 Finally, I passed The Schoolcraft Trading Post, which looked too cool to pass up. (And which I somehow managed to not get good pictures of, or an address for. **) What you can’t see from the photo below is that there was a collection of (apparently) pioneer-era buildings clustered together making up this business. There’s the main trading post, but there was also a small residence, and what looked like a school-house. They were selling all kinds of things–the trading post offered food items, bags, and shoes, but the school-house had kids’ toys and used books. (I don’t know about the house, as I didn’t go in. I just wanted to see the books!) I almost purchased an Edwardian Era book about how to be a good woman (because it was highly amusing), but decided against it. And of course, I am now feeling major non-buyer’s remorse. The owners were very friendly, if somewhat bemused by a single (apparently young) woman passing through alone when she “should” have been at school or work. I will confess, this trip has been somewhat odd, but I’m enjoying myself immensely. And, I must say that my timing was rather good. Although I won’t see autumnal foliage as I pass through, this is apparently their last week of business before they close for the winter. And I’m really glad that I got to stop here. This was quite an interesting set of shops! Rice procured, I went back on my merry way. At first, I stayed on U.S. 2, but I eventually realized that it would be very slow going if I stayed on it. After a certain amount of tail-chasing, I finally made my way down to I-90, and got a move on. 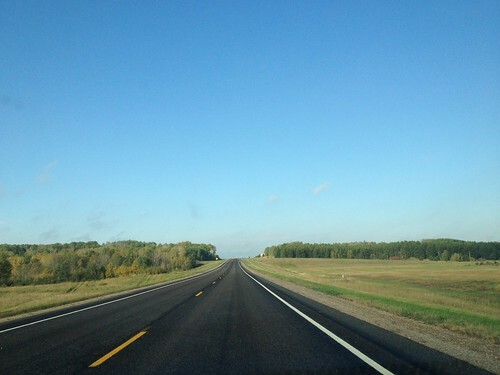 Rolling hills and trees turned to the flat grasslands of North Dakota. I passed a sign that said, “Devil’s Tower, that way***” but womanfully resisted the urge to turn off and lose another day. 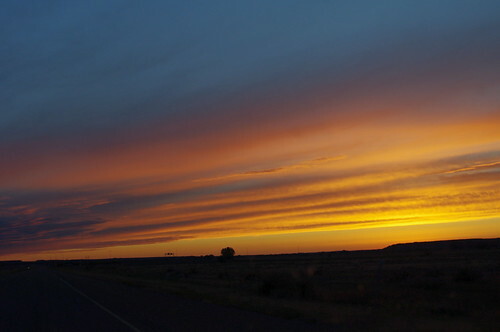 I really should have stopped to take photos with my Pentax, but again, I was in a hurry. 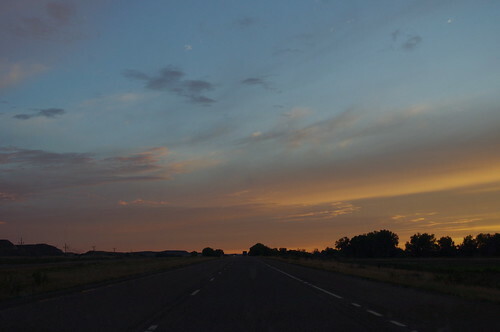 Eventually, Google Maps told me that I had gone about halfway to Seattle, so I decided to stop for the night in Billings. I got settled in at 11PM, and set my alarm for 5AM, hoping to get an early start in the morning. I was asleep almost as soon as my head hit the pillow. *Okay, okay, Wyoming. I’m skewing boundaries for the sake of narrative flow, but now I’m correcting myself for factual accuracy. Happy? **This sentence is so grammatically graceful that Kochan† is crying for joy, and she doesn’t know why. ***Yes, it totally said that exactly. I am not paraphrasing at all. Author’s Note: This post has been backdated for clarity of narrative.